Alice Helena (De Groot) Jasper was born April 30, 1921 to Harm John and Aaltje “Alice”(Koedam) at her parent’s farm home at Edgerton, MN. She attended country school District #43, grades 1-8. She helped area neighbors with child care and housework. Alice married Vernon (Bud) Jasper on September 15, 1941 in her parent’s home near Edgerton. They lived in Texas and southern California for a short time, then moved to a farm north of Edgerton. Later they moved to a dairy farm near Trosky where they raised their family and lived until retirement in June of 1978. Bud and Alice wintered in the Rio Grande Valley in Texas for several years. Vernon died April 2, 1994. In 2008 Alice moved into an apartment at Edgebrook. She moved to Edgebrook Care Center on September 19, 2018. Alice passed away on Thursday, October 4, 2018. Alice volunteered in the World Home Bible League Thrift Store in Worthington which she really enjoyed and continued until her 96th birthday. 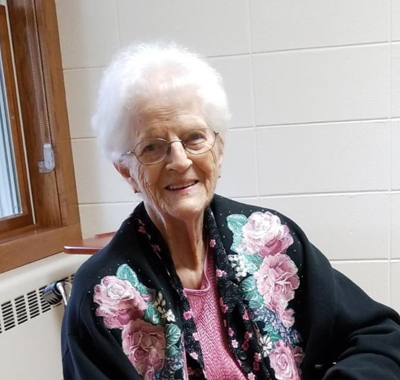 She was a member of Bethel Christian Reformed Church, Edgerton and the American Legion Post #42 Auxiliary.